OneCoast, LLC (“OneCoast”) values your trust and understands that you may be concerned about how your personal information may be used and shared. This statement describes our privacy practices and how we collect and use information. By visiting OneCoast.com, or any other website operated and managed by OneCoast (collectively, this “Site”), you are accepting the practices described in this notice. What Personal Information Does OneCoast.com collect? We receive and collect information that you submit on this Site or provide us in any other way. We use the information that you provide for such purposes as to provide you with a more personalized experience, to respond to your requests, and to communicate with you regarding products, services and promotions. We automatically receive and store certain information whenever you visit this Site. For example, like many web sites, we use “cookies” (described below) and obtain certain information whenever your Web browser accesses this Site. This information includes the Internet protocol (IP) address of your computer, your browser software and operating system, your web server, the date and time you access our site, session information (such as download errors and page response times), information about your viewing, search and purchase history and information about the referring URL and the URL clickstream to, through, and from this Site. We use this information to monitor the usage and performance of this Site, to enhance your experiences and to determine aggregate information about our user base and usage patterns. We may receive information about you from other sources and add it to your account information. We may receive information from OneCoast Affiliates or other vendors and add it to your account. “OneCoast Affiliates” include IvyStone Group, LLC, SnapRetail, LLC and any entity controlled by, or under common control with SnapRetail, LLC. We regularly send emails, newsletters and other electronic communications to our customers and other users. If you do not wish to receive emails, newsletters, or other electronic communications from us, you may opt out of receiving these communications. Please see Choice/Opt-Out below. 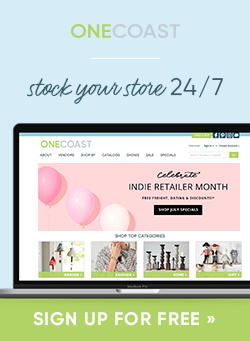 Affiliated Businesses, Vendors and Partners: We may share information with affiliated businesses, such as OneCoast Affiliates and our vendors and/or partners from whom, or with whose assistance, you purchase products or otherwise interact. This allows them to better serve you. For example, we provide information to a vendor whose products you order so that they are able to fulfill your order and email you an order confirmation and/or shipment details. Third-Party Service Providers: We engage other companies or individuals to perform functions on our behalf, such as order fulfillment, credit card payment processing, delivery services, postal mail and email, marketing assistance, and customer service. We may provide such service providers with access to personal information as needed to perform these functions. Offers and Promotions: We may send offers to you and/or selected groups on behalf of affiliated businesses, such as our vendors or sales representative partners. Market Research: We may aggregate website visitor information for market research purposes. For example, we may use this information to identify the fastest-selling products in the Southwest. We may share the results of this analysis with our partners, however, your personally identifiable information will not be revealed, other than as described in this policy. Business Transfers: As our business develops, we may buy or sell business divisions or subsidiaries. In connection with any such transaction, typically, Customer information is one of the transferred assets, however, it remains subject to any pre-existing Privacy Notice. 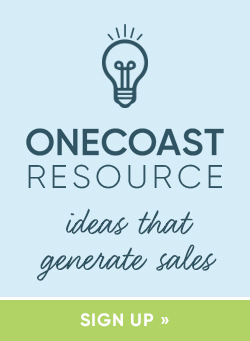 In the event that all, or substantially all of, OneCoast’s assets are acquired, customer information will be one of the acquired assets. With Your Consent: Other than as set forth above, you will receive notice when your personal information may be provided to third parties, and you will have the opportunity not to share the information. How is Information Protected by OneCoast? We protect your information by using Secured Sockets Layer (SSL) software, which encrypts information that you submit via the Site. For example, when our registration/order form prompts you to enter sensitive information (such as address or credit card number), that information is encrypted by the SSL software. OneCoast does not market or provide products or provide services to children. This Site is for adult use only. If you are under 18 years of age, you may not use this Site. Website registrants or newsletter subscribers who no longer to receive our newsletters or promotional materials may opt-out of receiving these communications by following the unsubscribe instructions in our e-mail communications, on the “My Account” page of this Site, or click here to unsubscribe.